Fighting free radical damage is key when it comes to winning the battle against disease. Free radicals are thought to accelerate the aging process. They damage cells and open the door for disease to take hold. One of the best defenses against this destructive process comes in the form of antioxidants. Antioxidants are present in all sorts of healing foods, but one of the best places to find these free-radical fighters are in herbs and spices. 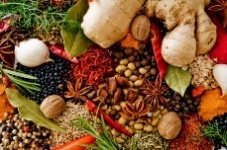 Researchers at the National Centre of Excellence in Functional Foods, University of Wollongong in New South Wales, recently highlighted the role of herbs and spices in protecting us all from disease. Herbs and spices have a long history of use, both when it comes to cultural heritage and in the appreciation of food and its links to health. But demonstrating the benefits of herbs and spices by scientific means remains a challenge, the researchers say, particularly when compared with standards applied for assessing pharmaceutical drugs. The problem is, pharmaceutical drugs are small-molecular-weight compounds consumed in a purified and concentrated form — making their health effects easy to track. Food, on the other hand, is eaten in combinations, in relatively large, unmeasured quantities, in highly socialized conditions. The real challenge lies not in proving whether foods, such as herbs and spices, have health benefits, but in defining what these benefits are and developing the methods to expose them by scientific means. — Consuming a half to one clove of garlic (or equivalent) daily may have a cholesterol-lowering effect of up to nine percent. The researchers offer this health advice: in addition to delivering antioxidant and other properties, herbs and spices can be used in recipes to replace less healthy ingredients. These include salt, sugar, and added saturated fat in, for example, marinades and dressings, stir-fry dishes, casseroles, soups, and curries. And for those who don’t eat meat, vegetable dishes and vegetarian options may be more appetizing (and healthier!) if you prepare them with herbs and spices. For information on how turmeric and garlic could benefit your heart, read this great article.